Come snow or shine, join the folks from The Common Space on the Science Beach in Sandown on Saturday for this free event to build your very own sandman or woman! Carrots, coal and hot chocolate on tap. It might not be made of snow, but this Saturday those folks from ‘The Common Space’ will be returning to Science Beach to build sandmen/snowmen. Come snow or shine, the The Common Space will be on the Science Beach – which can be found Browns Golf on Culver Parade, Sandown – between 10.30am until lunchtime on Saturday 26th January. Why not join them to build your very own sandman. Carrots and coal are provided and hot chocolate is on tap. 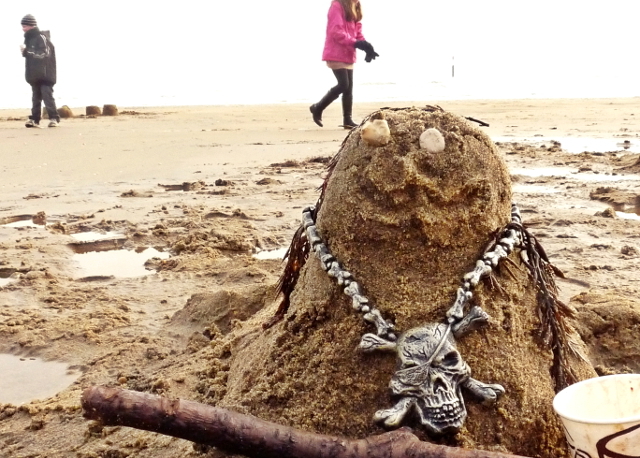 Take a bucket and spade and make sure you wrap up really warm. There’s a chance to take part in another free workshop on Sunday 27th January (10am – 1pm) at Brading Roman Villa. Join artists Babs Gowan, Caz Underwood, Ian Whitmore, Hannah George and Carol Jaye to explore and celebrate Brading Roman Villa and East Wight… in clay, pencil and collage. Learn about the Villa’s history and its landscapes through art, with plenty of time to explore more throughout the day. Suitable for adults and children over eight. All children must be accompanied by an adult. No experience is needed and all materials and entry fee are provided. Booking is essential as places are limited. To book, email claire@vectishousing.co.uk or call Vectis’s Sarah and Jen on 01983 525985. Make sure to arrive on the dot ready to start at 10am!